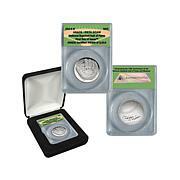 Mark the 200th anniversary of the Lewis & Clark expedition with this unique collection of coins and currency. 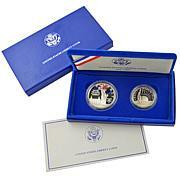 You receive the Buffalo, Ocean View and new obverse versions of the 24K gold-plated commemorative nickels. 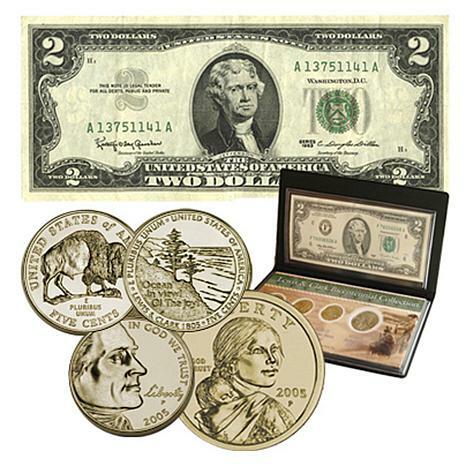 A Sacagawea dollar from the Denver mint and an original Green Seal $2 U.S. note in Uncirculated condition are also included. The $2 note with Jefferson's face features John Trumbull's painting "The Signing of the Declaration of Independence." Dollar measures approx. 1.04" in diameter and weighs approx. 2.89 oz. I purchased this set as a gift for my son-in-law and I know he will be extremely pleased. The set is in absolutely perfect condition. 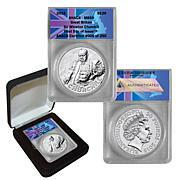 The coins are all '2005' as advertised. The $2 bill is perfect. I can't praise these coins enough. I am going to give this set and the book "Undaunted Courage" by Stephen E. Ambrose to my son-in-law. The book is the journey of Lewis and Clark. If you are on the fence and if you are a history buff, you won't be sorry. At least I was not. 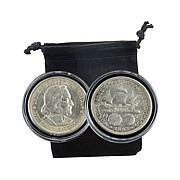 This set of coins and currency are a nice combination of the Lewis and Clark nickels, Sacagawea dollar, and $2 bill. A good addition to my collection. This is a great gift for my son to pass on to his daughter .. very happy with the set. Bought as keepsake for kids. It's great ! First commemorative set that I've purchased and it's a pleasant surprise! Love the notebook enclosure that keeps everything looking pristine. This is an interesting glimpse at history and a unique keepsake that will surely get passed down. Great price too!